Join Team Marygrove and help make a difference in the lives of children! Marygrove is proud to be an official charity of the GO! St. Louis Marathon once again! 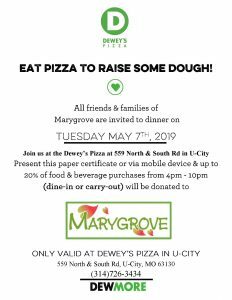 Join Team Marygrove and participate in the 2019 GO! St. Louis Marathon & Family Fitness Weekend on April 5-7, 2019. Events include a 5K, 10K, Marathon Relay, Half Marathon, and Marathon. Our goal is to raise $15,000 and have a team of 50 runners and walkers so the children at Marygrove can see how many friends they have within the community who also work hard to help give them brighter futures. Step 1: Setup your personal fundraising page by visiting the Crowdrise webpage at: https://www.crowdrise.com/o/en/campaign/2019-miles-for-marygrove. Step 2: Once your personal fundraising page is setup, please contact Gabby Ballard at 314-584-6124 or gballard@mgstl.org for instruction on race registration race and to receive a charity coupon code to use at registration checkout. DONATE TO OUR MILES FOR MARYGROVE FUNDRAISER ONLINE NOW!